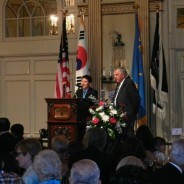 I am very honored to be with you as the representative of Korea’s Ministry of Patriots and Veterans Affairs. It is a very meaningful occasion for all of us who gather to honor and remember the sacrifices of those who fought, bled, went missing, and especially suffered brutal captivity during the Korean War. Proud Ex-Prisoner of War Veterans! I do not like to bring up and recall your pain, sufferings, sorrow and great sacrifice on this special occasion. But the record and the fact is clear on how all of you must have suffered so long ago, for my country, for this Great Nation and for a Better World! Yet who could ever forget for a minute the great bravery, sacrifice and sufferings of the veterans here today as well as around the world, the war has never been forgotten. It is always with them! It is not a forgotten and fading memory, but a sharp reality in their hearts and minds. Indeed, many who became prisoners of war had experienced the most bitter and brutal of the fighting in Korea. We all know, the world now knows, that half of your comrades perished in those wretched prison camps, and all of you faced the greatest of dangers and deprivation, and hell, and agony for every day you were in captivity. We also know that nearly 8,000 of your comrades are still unaccounted for, and the remains of thousands still are beneath the ground at the old prison camp sites. After the Armistice Agreement, the prisoners of war began to be repatriated, the story of the bravery of all of you gradually became known, but not as well-known as it should have been! Individual acts of bravery while prisoners of war became recognized in some cases, but not in enough! How can we ever repay you? It is impossible. But we have tried, by maintaining the faith that you had in our South Korean People… by not wasting the victory and the freedom that you gave to us! We have worked hard through all of the years since the war. We did to make Korea one of the most advanced and most democratic nations in the world! Because of you, we are achieving it. Korean War Veterans! You did us all, so very proud. All veterans here today ….please stand up and accept the salute of my nation! On behalf of my government and the people of Korea, I solemnly express our deepest gratitude to each and every one of you! You may see Korea’s success and prosperity as your own doing, rising from the ashes of the war. You may take pride in looking at today’s Dynamic Korea, skyscrapers, high buildings, booming businesses. You may no longer feel forgotten if you come to my country and will experience our love, our appreciation and the modern Korea. You deserve our unending honor, respect and appreciation, because you defended Korea and saved Korean people. Dear Ex- Prisoner of Korean War Veterans! If you can come to Louisville for this grand reunion… you can come to Seoul and Busan next year for another one! Our Ministry will invite your group to our Korea… to your Korea, your second home, the country that you made free, under veterans Revisit Korea Program. Please come, and let us show you our gratitude. Korean War Veterans, you have always been, and will always be… Our Heroes! May God continue to bless this Great Nation, and this Great State of Kentucky! The room rate is $110.00 per day, plus tax, which includes all meeting and banquet space. The discounted rate will apply three (3) days prior and after the scheduled reunion dates to accommodate those who may wish to come early or stay late. 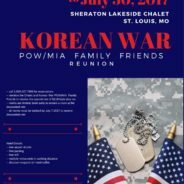 Reservations can be made by calling the hotel direct at 502-583-1234 and refer to The Korean War EX-POW Association reunion dates July 27 – August 3, 2014, or call Central Reservations at 1-888-888-5252. The Brown Hotel is a luxurious facility located in downtown Louisville with plenty of nearby eateries and exciting entertainment to enjoy. Free trolley service is provided throughout the city. The hotel will provide complimentary airport shuttle on a 24-hour basis. Hotel will also provide a discounted rate at $10.00 for self-parking and $12.00 for valet parking per day for overnight guest and those attendees commuting to the reunion. To register for reunion activities online click here.